Q: Nico, you've kept your cool when all around you were losing theirs. There were tyres going off, there were cars breaking down. Tell me, how do you feel to have won the British Grand Prix? Nico ROSBERG: Fantastic! It's a very, very special day and I think what makes it more special is that our factory is so close, and our team has done such a fantastic job to come through during the season. We have such momentum going at the moment, progressing all the time. Really, really massively quick in qualifying, also getting faster and faster in the race. I think today we had equally the fastest race car as well. So, it's a very special day for me. And this goes out... this is for all of my team colleagues working in the factory. I hope many of them have been in the grandstands watching. This one is for all of you out there. Thank you very much. Q: It was a dramatic race. You had two guys in the front who you had to beat. We lost Lewis Hamilton early in the race, that was a big disappointment to the British fans and then you were charging, you were chasing after Sebastian and then the leader of the World Championship, his car failed right here. What did you feel when that happened? 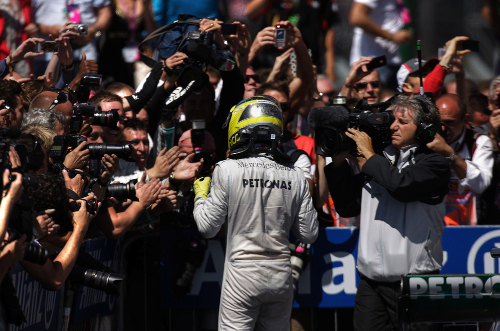 Rosberg: With Lewis, definitely I feel sorry for all the British fans. It would have been a great race for Lewis here in front of his home crowd - that's always a massive disappointment, but that's racing sometimes. When Sebastian stopped, to be honest, I won't lie, I wasn't disappointed by that one. And then from then it was a great race to win. Q: Mark, what a storming drive. You must have thought it was all over, the start didn't go so well, tell us about it. Mark WEBBER: I didn't have a clue what happened off the line. We've had two or three good starts in the last few races and then the lights went out and we're back to our normal tactics. So, I'm not sure. We need to have a look at why they pop up every now and again. That was frustrating. Then I had, I think it was Grosjean, take the front wing in the first corner, so the first stint was compromised by that. The boys did a great job to put a fresh front wing on at the stop and then we started to get the race underway from there. Obviously there was a lot of people with issues with the tyres which helped a bit but we were lucky not to have any issues. It was a clean race, good strategy. I think that, yeah I would have liked a few more laps at Nico but he deserved the win. He was quick all day, obviously. Little bit of fortune but anyway you've got to be there to capitalise. I'm very happy with second, team have done a good job and thanks - last time here in Formula One in front of the British fans - thank you very much. Q: Fernando, you again drove a storming race. You really got caught out by the second safety car - you were down and had to charge back up through the field. Fantastic drive back into the podium. Fernando ALONSO: Yeah, it was a good race for us. With the last safety car we lost six positions because of the safety car. But overall I think it has been a very lucky race for us. Looking at the problems with the tyres of some of the drivers, we fact we didn't any problem we have to consider lucky. And then with Sebastian's problem, as Nico touched on before, we've been also lucky to recover some points. At the end it was a very good Sunday and hopefully we put on a good show for the great, great fans. They've been here from Thursday to today, supporting all the teams, respecting all the teams. Thank you very much. Q: The championship, is it blown open now? Here you have a points gain on Sebastian. Alonso: Mixed feelings to be honest. Happy for the points, we've reduced the gap a little bit in this race but the pace we saw this weekend is not good enough. There were some other Sundays that we lost some points and maybe I was more optimistic. Today we recovered some points but we know there is a lot of work to do. But I trust the team, we are united, we have a difficult weekend, we put the cross and now we think of the next one. Q: What did you think before Sergio Perez when his tyre blew? What was going through your mind there? Alonso: I've had two moments, that one with Sergio I was so scared and so lucky because I missed the contact by one centimetre. And also at the start into turn one. I locked the tyres and nearly lost the front wheel. As I said, some risky moments. All of them were fine for me today, so I just need to enjoy the result but from tomorrow working in Germany race because we need to raise our game. Q: Nico, now you're heading to Germany. Second grand prix victory this season and you have a German manufacturer in Mercedes. It's going to be a fantastic event in Germany isn't it, next week? Rosberg: Yeah, for sure. Going from the team's home grand prix here to my second home grand prix - I already had one - fortunately for me I have two home grands prix, I managed to win that in Monaco. Second one coming up at Nurburgring. And it's very special. I'm very proud to be German, driving a Silver Arrow, going to the Nurburgring, the history there, and having that great car that I have at the moment, really looking forward to that. Q: The tide's going to change a little bit, isn't it? You seem to have a car that's competitive during the race. The tyre degradation wasn't nearly as bad. Is there any chance, do you think, that this championship could be turning a tide here against Red Bull? Rosberg: Well, I wouldn't talk about that just yet but definitely the team has done such a good job during the season. Already in the winter, to come up with such a quick car, which we've had all year in qualifying, and now also progressing with tyre management and getting that better and better to allow us to win races now, that's fantastic to see and really gives me... yeah, just very exciting. Q: Where you happy to continue racing when you were told about the tyre issue? Rosberg: It's definitely something that needs to be looked into, yeah? Because too much of that today, that's for sure. I had one too - but got a bit lucky there with the safety car so that worked out great. Q: Nico, congratulations, great win for Mercedes, based just a few kilometres down the road from this Silverstone circuit. What does this win mean to you, and to them? Rosberg: Yeah, fantastic day definitely, and it's very special because it's the home grand prix of the team and the factory is ten minutes away. A lot of people, a lot of my fellow team members and colleagues are in the grandstands, watching today and it's very, very nice that I was able to give them such a great race and such a great result. They really deserve it - you really deserve it because you've worked so well all season. It's great to see the momentum we have in the team at the moment. Q: There was obviously some brilliant driving, some brilliant overtaking but no doubt the big story coming out of this obviously is the situation with the tyres. Your thoughts on what we've seen today. Rosberg: Definitely that's a problem. Too many tyre failures and they must look into that and see what can be done. Q: Mark, you almost got him at the end. 0.7 seconds as you crossed the finish line of a race you've won twice - you obviously enjoy it very much here. Great recovery though, after a poor start. Just listening to the tone of your radio messages, is it tempting to say that you feel a win got away from you today? Webber: Oh yes, it's easy to say that. With ten laps to go when you can see the win in sight. It is mixed feelings when you finish seven-tenths behind Nico for the win. But he's also out there doing his things, so he deserved the win. We did recover. I think we had a bit of luck after that but we've got to be there to capitalise on it. We had a good strategy, obviously I pushed very hard on the laps I had to do the business. The start... I don't know. I have no idea how we can get so good some weekends and then not at others. That was a big negative for us. And then Grosjean - someone, I think it was him - touched my front wing at turn one. I had to get that changes at the first stop. And then the race really reset from there. The safety cars obviously helped - although I didn't want them because of the reasons why they were happening. Obviously it's very nervous for all the drivers to see that happening. In the end, very, very good result for myself, for the team, still go something out of it, what was... looked like a pretty random weekend for everyone on race day. I want to thank all the English and British fans for the support that I've had over the years racing here - it's been a real highlight for me to race at this circuit. So, very much looking forward to the next race and hoping to challenge again. I was happy with my performance today. Q: You mentioned it's a nervous time for the drivers. Four left-rear tyre failures, one front-left tyre failure. Your thoughts on that - and what it feels like to know you've got to carry on and press in that situation. RB: Well the team are trying to keep us up to date as best they can. Obviously it's a little bit of a moving target for them as well. They are doing their job to inform us as much as they can. It's not a slow circuit, it's very quick, we're committed to the high-speed stuff here, 100 per cent most of the time. It's not December yet, so I'll stay quiet. Q: Fernando, a very quick call when Vettel retired there, to come in and make a stop. Dropped you down to eighth. I was wondering whether the team had made a mistake there but you managed to fight your way through some amazing overtakes. Did you think you might have blown it at that point? And your thoughts on the race. Alonso: No, obviously it was an unlucky situation. They called me in around Turn Five. So, Vettel was not having the problem yet at that point they call me. We were in this lap and we try to pass Webber and Kimi, they were slowing down a little bit in front of us, so we committed to stop before Sebastian's problem. And then yes, I go out of the pits and I see 'Safety Car Deployed.' Obviously it was the worst time possible to have a safety car, when you have just pitted, and we lost an extra five positions. I don't know how many overtakings I did all the whole race. The start was probably the worst start of years. Probably. I was fighting with Hulkenberg in Turn Three, Turn Four, and I remember he was not in the first positions on the grid so I realised I was quite far down there. After the start we recovered some positions, some safety car moments as we touch on, and then the last big push at the end as we try to get a podium. We did it, it's a fantastic result for our very difficult weekend. Sometimes we have very good pace, we have a car that is able to fight for the wins and we are out of the podium. This weekend everything went a little bit on the wrong side for us, we get the podium and Sebastian doesn't finish the race. It's one of these weekends where the result is very good but the feeling is that we must improve for next weekend. Q: Obviously on the day when your main title rival retires, you want to try to take 25 points and not 15 but the qualifying situation really wouldn't allow you to do that today. What do you go away from this weekend and back to Maranello telling the team? Alonso: Well it was not the qualifying, it was the weekend in general. We were normally very fast on Fridays, on the long run pace. It was not the case here. We were not fast on qualifying and not fast on the race - so definitely was the overall weekend we didn't manage to make the tyres work. We've been very lucky - unlucky with the safety car moment that came out but very lucky with the first corner, that it was very close with Mark and Grosjean I think. In the first stop, lap nine, I had a tyre problem also. My tyre was finished and disintegrate in the last corner. For me it was the right rear that I think was new compared to all the other failures and if this happened like Felipe - that I think was in Turn Five when it happened - then I lose the race. For me it happened in the last corner and I pit. At the end it was a very lucky race and I just need to be very thankful for the team, for the luck and try to improve for next weekend. Q: (Graham Keilloh) Early in the race, after the first three rear tyre failures, there was some radio contact on the television advising drivers to stay off the kerbs, but it seems subsequently that wasn't really heeded; just talk us through the thought process of that, why you subsequently decided to take the risk? Rosberg: Are you saying we were still taking the risks of going on the kerbs? Well, for myself I wasn't, I was staying off the kerbs and I got a tyre problem myself, but it worked out well, I was able to pit before it broke apart because the safety car came out. I was a bit lucky there. And then after that, when Mark was chasing me, it was a compromise between how fast is he coming at me and how much am I going to take out of the tyres, so I was staying off the kerbs, taking it easy in the high speed where the most damage is done. Then I had to pick up the pace a little bit towards the end as he was getting quite close so that was really difficult to judge. Q: Mark, they broadcast at least four or five messages from Rocky (Guillaume Rocquelin) to Sebastian telling him to stay off the kerbs; were you getting a similar amount of that kind of message? Webber: Yeah, Simon was keeping me up to date with the... That's all they could give us was staying off the kerbs because they were saying that they probably didn't really know why the tyres were failing at the rate they were. So yeah, I did what I could in all the right hand corners to have... turn one, exit of seven, also Copse and Becketts and Stowe, all the fast corners, trying to stay away from there. It's not always easy but in general I tried to adhere to the advice, because yes, you want to gain a little bit here and there, but as Nico touched on, it's not much fun driving a Formula One car on three tyres so you have to make sure that you do what you can to listen to the team; they're on the pit wall with the most information so you have to do what they say. Alonso: Same, always the same. They kept telling me to avoid the kerbs but obviously if you're in position twelve you need to attack, you need to change the racing line, you need to use the DRS. This is a circuit where we've been racing for 12 years in my case and I've never had these problems. I think the kerbs were perfectly OK.
Q: (Mike Doodson - Auto Action) Mark, you're not the kind of guy who normally blames his equipment, less so perhaps than other people, but this story of your starts goes back a long way. No doubt you've analysed it over and over again. Looking back today, was it possibly a human failure on your side or was it an equipment shortcoming of some kind? Webber: I need to look. We know it's not the strength of our situation up until Monaco. I think Monaco and Canada, same procedure and we're running into the back of these guys. Same in Canada, I went round Bottas and we were very very strong off the line. Today, reverse was in gear. I was obviously ready for the start, everything was set, but I didn't go anywhere, obviously. I think it was quite slippery off the line but we had a lot of issues getting away. It is frustrating, mate, but I need to go through it and we're working on things to make it more consistent in the future, but it's just such an important part of the weekend and it's a no-brainer that you have to get it right, all the effort that goes in. There's no question about it, it's cost a lot of good points over the time but yeah, it shouldn't be that difficult but it turns out that we've got to improve on that area and I'm happy to be part of that. Q: (Jaime Rodriguez - El Mundo) Fernando, in the last races, every Sunday you seem to have to overtake five, six positions from the start to the end; I wonder if you would explain what you feel, both physically and psychologically? Alonso: I've been doing this for the last five years, unfortunately. It would be nice to start on the front row of the grid but we are not good enough on Saturdays and it's something we try to work on as a team: the package, car performance, tyre preparations, driver maximising the lap. Whatever we are missing on Saturdays, we haven't been on pole position for a long time but we fight, we gain some good experiences in my career, especially in 2008 and 2009 were maybe not so bad seasons in the end, with no good results but very good experience and you try to play safe, obviously when you are fighting very hard with some rookie drivers etc it requires a little bit of extra care but we managed today to do some good moves and some good points, but as I said, it's something that we don't like to do and we would like to improve Saturday's situation. Q: (Christobal Rosaleny - Car and Driver) To all of you: I know Nurburgring is not like Silverstone in terms of fast corners and all of that, but if somebody tells you that the same thing is going to happen, that the tyres could explode there, would you race or would you tell the people that's enough? Rosberg: Well, we shouldn't get into that situation. We need to do what needs to be done to sort it out and make the tyres last. Webber: I think we've been trying to have input for the last three years and it's deaf ears. Anyway, we're part of the package, part of the show. The show goes on by the looks of it. Alonso: Yes. Same. Theoretically the cars are the same all year. They were OK on most circuits so it should be OK, but for sure it's something that what we saw today is not good but we drive the cars so we understand nothing about what is the real problem or what it is the real solution so it's a question for them, for sure. Q: (Luke Smith - NBC Sports) Nico, before Sebastian's stoppage, the gap between Sebastian and you had remained quite constant. Do you think you would have been able to catch him if he hadn't have had the retirement? Rosberg: I was trying, I was pushing hard trying to stay with him but it wouldn't have been possible. No, I would have been close all race but to catch him and pass, I didn't have enough speed unfortunately. But I think pace-wise, possibly I was a little bit quicker, yeah, because very often I was able to come back to him once I started pushing again before the pit stops and when you're in the dirty air from the guy in front, your tyres wear a little bit more and you lose out. I think I had good pace in the race today. Q: (Stewart Bell - Herald Sun) Mark, you were on fire from that last safety car period to the end; what was that like for you, that last stint, especially given it was your last British Grand Prix? Webber: Yeah, it felt pretty good mate, I knew that I was going to make pretty light work of the guys ahead of me because they were on old tyres. I wanted information on Nico, I wanted to know what compound he was on and how his pace was before the safety car because I hadn't seen him before in the race at any stage. They said that he was pretty quick so I was pretty keen to get past those guys early and then go from there, but both of us managed to get to the end of course on the limit but also managing the scenario with the tyres. So yeah, it was a nice finish to race. It would have been about a hundred cherries on top if I'd managed to get past him but I didn't. He deserved the win and we made him work for it which was good and rewarding, but we could have got much more out of the car in the race today to be honest. Q: (Michael Schmidt - Auto, Motor und Sport) I think all of you were asked by your race engineers after the tyre failures to stay off the kerbs; how much did it affect your racing, in particular Mark and Fernando who had been in fights or battles with other drivers? Webber: Well, it's a compromise. You want to still push as hard as possible but you have to check your line a bit, change your trajectory, the radius is tighter, obviously, in certain corners, i.e. the quick stuff, Copse, Stowe, turn one, staying away from there. It turns out maybe it wasn't really the kerbs, who knows but it's just better to factor in everything that you possibly can. Some laps, when you're in disturbed air and you get behind a car and you get a little bit wide then that's life, you've got to... you can't be super accurate when you're tucked up behind the guy in the quick stuff so that's just the decisions you have to make and yeah, we managed that as best we could. Alonso: I didn't change, I didn't change lines. I didn't change lines. I was fighting with twelve cars all the race through so you go in the dirty air, let's say, and you lose downforce and you go straight out over the exit kerb. As I said, it's hard to believe that the kerbs were the problem because we've been racing here for 12 years with those kerbs. Q: (Jaime Rodriguez - El Mundo) Nico, do you think that without the Montmelo test Mercedes could be winning races like now? Rosberg: For sure, yeah. Definitely.